By now, you know I love cooking vegetarian meals. I’m so lucky that my husband doesn’t mind eating at least one vegetarian meal a week. Sometimes 2-3 if I catch him on a good week! I knew that this might be pushing it on the vegetarian meal level, so I set aside a chicken breast to grill. When I told my husband what we were having that evening he responded “I don’t need any chicken tonight”, and then I showed him the photo (because I think at times I know his eating habits better than he knows his eating habits)! Once I showed him the photo he replied… “ok I need chicken this looks too vegetarian for me!” So I cooked the main dish and he grilled his chicken breast. We both loved this dish, and of course my husband piped in and told me that this dish is best paired with a chicken breast. So, if you aren’t quite ready to take as deep of a vegetarian recipe dive I suggest you serve it with a grilled chicken breast. I have a few friends who have come to me recently for vegetarian recipes. They want to start cooking at least 1 vegetarian meal a week. One of my friends even wants to start having 3 vegetarian meals a week. My advice to her was to start off slow. Start by making one meal a week. After a few weeks then start cutting back on your meat portions. The suggested servings size of meat is a palm full. Most Americans eat 2-3 times the suggested serving amount. With a dish like this I would suggest to serve half a chicken breast; sliced so it looks like you’re getting more. After all, we eat with our eyes, so illusions can help! Slowly ease yourself into eating a vegetarian meal a week if you aren’t already doing so. Not only is it great for our environment, it helps your health, and your bank account! In a large pot of boiling salted water, cook broccoli until tender and bright green, about 4 minutes. With a slotted spoon, transfer broccoli to a food processor. Return water to a boil and cook pasta according to package instructions. Reserve 2 cups pasta water; drain pasta and return to pot. To food processor, add oil, Parmesan, lemon zest and juice, parsley, and garlic. Puree until smooth, about 2 minutes, scraping down side as needed. Transfer pesto to pot with pasta. Stir to coat, adding enough reserved pasta water to make a creamy sauce. Stir in beans and heat over medium until warmed through. Season with salt and pepper. To serve, sprinkle with Parmesan, if desired. 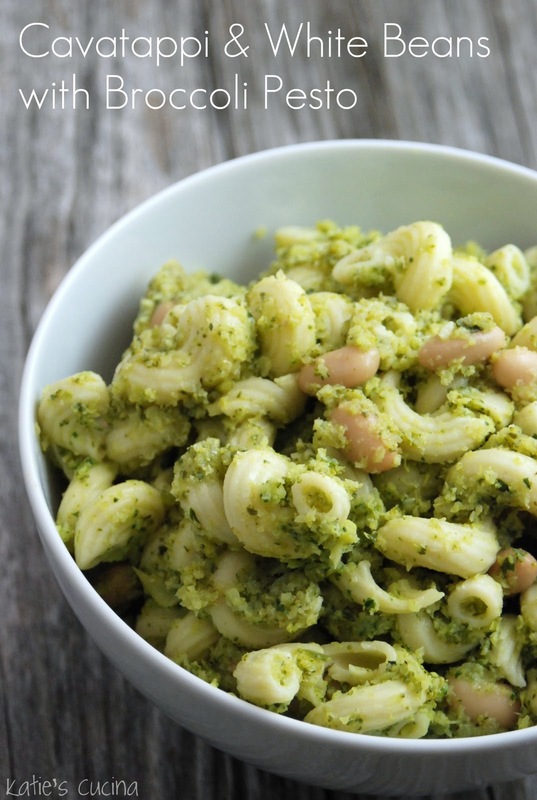 I'm loving the idea of broccoli pesto – pinning! Looks amazing. I love broccoli and I love pesto – cannot wait to try!! Made this tonight and it was awesome. The lemon makes it very fresh!